If you have heard of Bhringaraj before, you probably have heard of its use as a hair tonic or its unique ability to restore the hair. 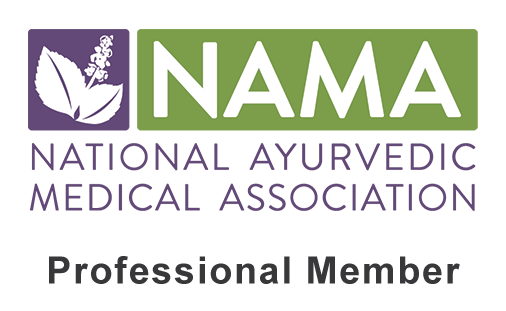 This incredible Ayurvedic herb quite possibly is the best option for preventing and treating premature greying and baldness, making it a main ingredient in any Ayurvedic Hair Oil. However, Bhringaraj possesses many other health benefits, including being a powerful liver tonic, alleviating inflammation, healing skin issues, calming the mind, treating insomnia and strengthening the bones and teeth. Bhringaraj is translated as “the king of eyebrows” showing its ability to awaken intelligence and memory. It also has been called Kesha-raja, which translates maybe more appropriately as “the king of hair”. This herb can be taken either internally or applied externally (typically infused in an oil), depending on your healthcare needs. For many issues that Bhringaraj may treat, it may be even more effective to do both simultaneously. For instance, if you are suffering from insomnia, it would be recommended to not only take Bhringaraj internally as part of a balanced herbal formula, but also apply Bhringaraj Oil to the scalp and feet each night to calm the mind and ground the energy. 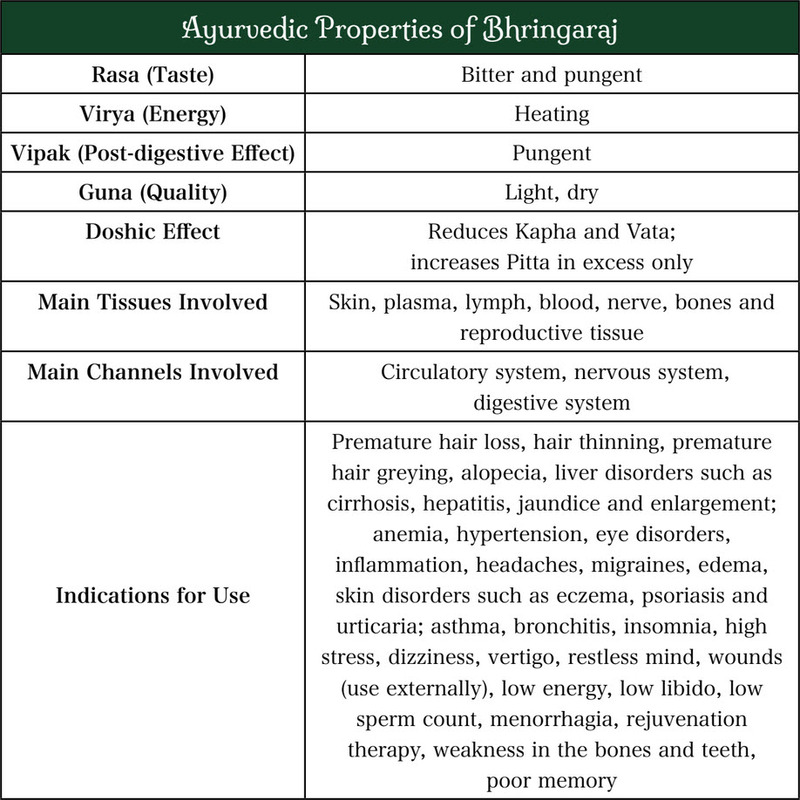 Bhringaraj is best for Kapha and Vata disorders, however it can be extremely useful in Pitta disorders as long as it is balanced out with some cooling herbs. In fact many issues with hair loss and greying of the hair stem from excessive Pitta in the head, making this herb a necessity, as long as it is used in a balanced and intelligent manner. Massage Bhringaraj Oil or an Ayurvedic Hair Oil with Bhringaraj onto the scalp each night before bed. Ideally the oil should contain coconut oil or another cooling oil as the base in order to control the Pitta that tends to cause these issues. Massage deep and slow to increase the blood flow to the scalp, reduce tension and allow the oil to penetrate into the follicles. **For an added bonus, end by massaging the soles of the feet with the same oil, as this indirectly helps to alleviate these issues. Take 1/2 tsp of the mixture Bhringaraj, Kutki and Neem (equal parts) three times daily, after meals. Mix this in 1/2 cup of warm water, let steep for a few minutes, stir well and drink without straining. Follow with a couple sips of warm water. **For skin issues, simultaneously apply a cooling medicated oil containing Neem and Bhringaraj (such as the Pitta Massage Oil) to the effected area before bed each night. Take 1/2 tsp of the mixture Bhringaraj, Jatamansi and Brahmi (in equal parts) three times daily, after meals. Mix this in 1/2 cup of warm water, let steep for a few minutes, stir well and drink without straining. Follow with a couple sips of warm water. Take 1/2 tsp of the mixture Bhringaraj, Ashwagandha and Shankapushpi (in equal parts) 30 minutes before the desired bedtime. Mix this in 1/2 cup of warm water, let steep for a few minutes, stir well and drink without straining. Follow with a couple sips of warm water. Take 1/2 tsp of Bhringaraj mixed with 1/4 tsp of Trikatu in a spoonful of honey. Wash down with warm water. Take as needed of three times daily (before meals) for chronic issues. Take 1 tsp of Bhringaraj powder mixed in 1/2 cup of homemade yogurt. Add a pinch of black pepper and turmeric. Take this daily until the anemia has healed. **Kapha types can reduce the amount of fresh yogurt to 1/4 cup and add a small amount of water (similar to a lassi). Make a paste out of Bhringaraj and Ginger (3 parts to 1 part), and massage onto the forehead. Alternatively, one can massage a warm medicated oil containing Bhringaraj and Ginger (such as Kapha Massage Oil). For severe headaches and migraines, one can soak this warm oil into a old washcloth. Then apply it to the forehead while lying down in a dark room. Keep this on for at least 15 minutes. 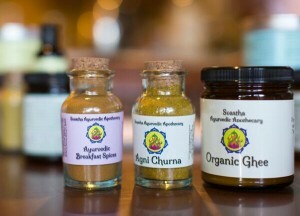 Click here to see our full apothecary menu.